The purpose of the Casterton Community Museum, owned and operated by the Casterton and District Historical Society Inc., is to collect, preserve, research and exhibit objects that relate to the people, events and history of Casterton and its surrounding districts. 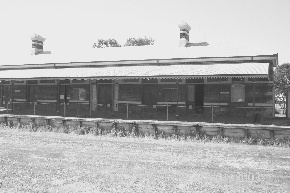 The museum is housed in the historic Casterton Railway Station, the first of the so called “Casterton” type station houses. Successful submissions to the state Heritage Commission and the Glenelg Shire Council resulted in funds being made available to restore the station house. The whole site of some 14 acres is being developed by various town groups under the overall guidance of a special council committee. The station house and other buildings within the site have gained additional significance by being accepted for State Heritage listing. The society was founded in the 1960’s with a view to collating the history of Casterton and District. Obtaining the Railway Station and restoration of the building has provided a home for the collection of over 3,500 items ranging from small household items to clothing and farm machinery. The museum has a comprehensive photographic collection. The town is currently placing a “Kelpie” walk trail, and looking forward to a Kelpie Interpretive Centre, which will be near the Museum and complex and both will be part of the walk area. The Society is aiming at attaining Accreditation of the Museum and much work will need to be completed to achieve this aim. Currently, the Museum is in the process of cataloguing the entire collection and is seeking funds to have a Preservation Survey completed as part of the Accreditation process. The society has a very small but dedicated group of volunteers who are playing a vital role in the preservation of the Museum. The Museum is open to the public by appointment. Contact Secretary - details listed on Casterton Historical Society main page.